Our annual Singing Day is always greatly enjoyed by members of Newport (Salop) & District Male Voice Choir, and hopefully also by our guests. This year’s event was no exception. 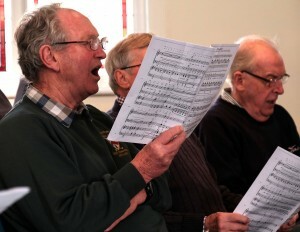 We were delighted to welcome Sam, Gordon and Brian, three friends who came along to sing with us, and we hope that they enjoyed the day as much as we did. We also hope that they will swell the numbers in our choir by becoming members. Under the guidance of our musical director, Vivian Redfern, and accompanied by our pianist, Mike Ward, we spent the day learning three pieces that will feature as part of our repertoire this year. These were My Way (synonymous with Frank Sinatra), Delilah (synonymous with Tom Jones), and Every Time I Feel the Spirit (a spiritual, which dates from the US civil war). We weren’t only there for the music, though. Members of our of ladies committee served up the most lovely cakes along with tea and coffee etc during our breaks. Our thanks, as ever, to them. If anybody reading this is interested in singing in our very friendly and hard working choir, please feel free to come along to any of our practices, either to hear us sing, or to join in. You are assured of a warm welcome. We meet for a couple of hours on Monday nights at 7.30 pm at Trinity Church, Wellington Road, Newport, TF10 7HF. 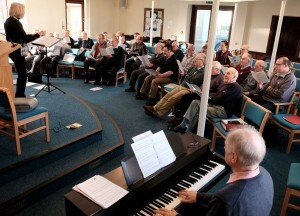 If you would like to enquire about the choir prior to coming along please contact our Secretary, Alan Wright. His phone no is 01952 813267, or you can email him by clicking on this link. 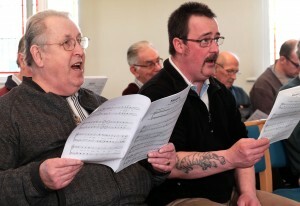 Thanks to choir member Ian Dunning for the photos on this page.